I run Archlinux with i3wm, installed VirtualBox via pacman (virtualbox). A recent update has caused nasty behavior around window sizing for guests: using the "auto-resize" feature is completely broken. The window is now resized to some seemingly arbitrary size, and I cannot override it (it just resizes right back). It also cannot be auto reassigned to a specific workspace. VBox.log (140.6 KB) - added by Will Everett 3 years ago. vbox_window_resize.zip (2.0 KB) - added by 1337 3 years ago. vb_tree.log (6.8 KB) - added by Airblader 3 years ago. x11trace_vbox.zip (331.5 KB) - added by afwlehmann 3 years ago. issue2.JPG (63.6 KB) - added by 1337 3 years ago. issue.JPG (179.5 KB) - added by 1337 3 years ago. xtrace.awesomwm.virtualbox.zip (311.6 KB) - added by nickez 3 years ago. backtraces.log (53.1 KB) - added by michael 3 years ago. screenshot.jpg (268.5 KB) - added by Airblader 3 years ago. i3-qt5-test.png (18.4 KB) - added by vushakov 3 years ago. Simple test app that resizes its window (never mind the "Move" caption :) and demonstrates the Qt5 bug. setGeometry.patch (9.4 KB) - added by michael 3 years ago. r111428-r111430-r111508.patch (13.4 KB) - added by michael 2 years ago. Current at this time patch against 5.1. May have slight fuzz when applying. r111428-r111430-r111508-r111561.patch (13.5 KB) - added by michael 2 years ago. screenshots.png (339.9 KB) - added by maximilianoadl 2 years ago. VM window is some tiny value by default (maybe 50x100?). If auto-resize guest display is turned on, the window immediately reverts to this tiny value when changed. If auto-resize is turned off the window can be resized and the guest display stays at whatever the set value is. This happens regardless of whether the 5.1.4 Guest Additions or Oracle VM VirtualBox Extension Pack are installed. machine is forced inside that subwindow. what is focused before switching to the virtual machine window. You can read more about the system setup and see the attached screenshot at the linked bug URL . Will Everett, which versin of the VirtualBox Guest Additions do you have installed in your guest? I have the same issues since updating VB from version 5.0.22-1 to 5.1.6-1. In my case the resize-functionality actually works, but the guestVM is displayed the way it is shown on your picture. This happens even with Linux guestVMs where no xorg is installed, so the guest-additions shouldn't be relevant for this issue. In my opinion the source of the issue is more like an missing “redraw-window” call or something like that in the newer VB versions. My workaround is to restart i3 (checkout your i3-config, there has to be a shortcut definition like this: „bindsym $mod+Shift+Q restart“). This forces i3 to redraw all windows. Unfortunately the restart has to be initiated every time the guest-VM changes the resolution (for example at and after the boot-process or after moving the guest-Window to a workspace with different resolution). The upgrade to 5.1.6 didn't fix anything. Removing the extension pack doesn't change anything. I also think it's worth pointing out that this happens with both a Windows 7 guest and a Kubuntu 12.04 guest. I didn't say, that the upgrade to 5.1.6-1 solved the problem for me, rather it introduced it! Have you tried the workaround? If this solves your problem as well, maybe it would help to find the source of this issue. Sometimes I have to restart i3 up to 4 times until the window is displayed right. This is annoying and I really hope that this issue will be fixed in the upcoming version. Is my understanding correct that everyone experiencing this issue is using i3 (which I'm afraid I don't think anyone on our team knows) on their host? Interaction between applications and window managers tends to be a rather complex matter. Has anyone tried reporting this to the i3 developers? Either on their bug tracker, or just on a mailing list or on IRC? It might help to get it resolved if one of the i3 developers can reproduce the issue and join this ticket to help sort it out. I suspect this is something they will be able to analyse much faster than we could. I am getting exactly the same issue using the wmii window manager. Similarly to i3, it is a tiling window manager. Thus I doubt it is a i3-specific issue. I still suspect that it could be solved much faster with the help of the i3 developers. I found another strange error, which is causing vm-crash and described it here: https://www.virtualbox.org/ticket/16059 It could be related to this issue and maybe you guys using tiling wms should take a note of that. I have now downgraded vbox to the old version and everything works just fine. Furthermore I picked the log-lines which are outputed while resizing the window in the new(buggy) and old(stable) version. I added few comments to specify the state of my guestvm and the performed actions. Virtualbox spans up *quite* the tree of windows. What is that all about? Periodically (and I assume when the weird resizes happen) different VirtualBox windows start spamming i3 with client messages revolving around _NET_WM_STATE_ABOVE and _NET_WM_STATE_BELOW. It seems like each window sends one pair of those two. Neither of those are supported by i3 (and i3 doesn't claim to support either in _NET_SUPPORTED.) I'm getting the feeling this is related to the issue, perhaps different VirtualBox windows are somehow fighting with each other, possibly because i3 doesn't do what they want us to do? I'll attach a file that contains the entire tree spanned by VirtualBox. I actually think this is not directly related to window manager involvement. Despite the weird size(s) of the VM, VirtualBox's window does have the full size, so whatever VirtualBox does there, it does it within its window – and what happens inside a client window is the client's job, i3 knows nothing about that. Of course it likely has indirectly to do with i3 because I assume VirtualBox is trying to figure out its size or something. I think it'd be useful if you could figure out based on what VirtualBox triggers the resizes and then we can look at how i3 provides this information differently than other window managers and whether it's an i3 issue or a VirtualBox issue. Airblader, thank you for taking the time to look at this. Unfortunately I am not the UI developer, who is rather overloaded with tasks already, though I do have some knowledge of that code. I'm afraid I don't know either why we use quite that many windows - I think it is probably due to Qt using native windows for widgets (which it sometimes does and sometimes does not). The client messages almost certainly come from Qt, based on the scientific reasoning that I find that text in the Qt Xcb integration code and not in our sources (and I tend to know what code of ours sends client messages). The reason that you can't run VirtualBox under xtrace is probably that it is setuid. Not quite sure how to get round that, as it is not actually meant to be run as root (it drops privileges pretty fast). I wonder if there are any tools to do the tracing on the X server side. Now some questions of mine, given that I have never used a tiling window manager. VirtualBox's default behaviour, when auto-resizing is enabled, is to adjust the desktop size of the virtual machine it is running to match the size of the window it is displayed in whenever that changes. I would naively assume that it was i3 which was forcing the host window to a certain size, and generally we try to fit in with what the window manager wants. Given that background, how correct or incorrect does the behaviour appear to you? VirtualBox's default behaviour, when auto-resizing is enabled, is to adjust the desktop size of the virtual machine it is running to match the size of the window it is displayed in whenever that changes. Can you point me towards the relevant parts in VirtualBox's source code? I think if I took a look at it I might get a better bigger picture. I would naively assume that it was i3 which was forcing the host window to a certain size, and generally we try to fit in with what the window manager wants. Given that background, how correct or incorrect does the behaviour appear to you? Your description sounds fine. The client (VirtualBox) asks to be a certain size or in a certain position. A typical (floating) WM will simply grant that. Tiling window managers will deny the request and instead force the position and geometry on the client. This comes back to the client in the form of a ConfigureNotify event. The crucial part is that the client actually waits for this event and uses its value, some clients make the mistake of assuming their request will be honored. I'm confident that QT is not doing anything wrong here, it's an established tool that generally works just fine with i3. I'm not sure how QT works, though, since I never used it mysel, so I'd like looking at how VirtualBox interacts with QT here. I'll try that tomorrow. I really think an xtrace could help a lot here. It would allow us to see whether X, i3 or VirtualBox/QT request the size changes. Running VirtualBox under xtrace just doesn't work for me. It just stops dead after half a second and nothing ever happens. Tomorrow I think I might just try doing it in reverse and running i3 under xtrace. I couldn't resist and just tried right now. :-) Unfortunately it didn't go any better. I tried both xtrace and xscope. I'm pretty sure I've ran i3 under xtrace before, but other applications seem to run fine under xtrace, so I'm not sure what the problem is. The comment by psychon in the linked awesomeWM ticket, while harsh, looks pretty worrying to me. If this is still in the VirtualBox code and the code path triggered here it might have to do with the issue. 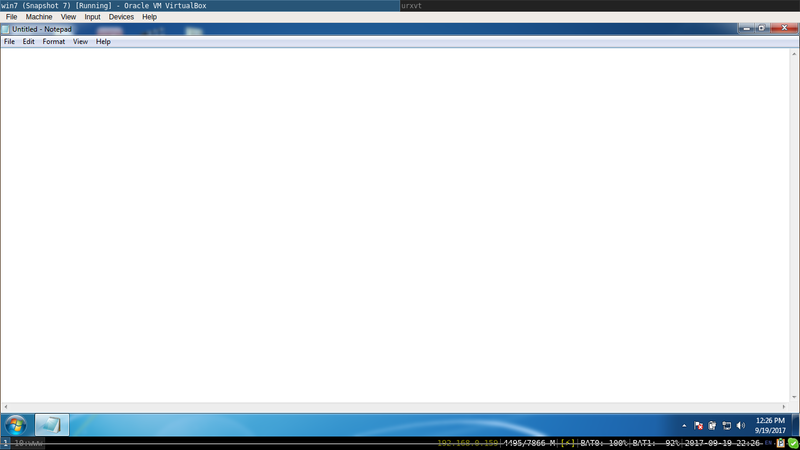 I have i3 set to always treat virtualbox windows as floating and it always defaults to the small size from above. So in my case i3 shouldn't be telling virtualbox what size to use, it should be virtualbox that's telling i3 what size to make the window. I will write up a bit of documentation on our wiki regarding resizing when I get a moment (as you can guess it is not completely simple). But I can reassure you regarding that code that you found. That is part of our 3D pass-though code, which only executes on the guest (and is interacting with windows and usually a window manager which purely exist inside the guest), and which is horribly ugly. It is basically an old project by Brian Paul to pack OpenGL over a network link and render it on a different machine, which was made to work in X11 guests by programmers mainly from a Windows background. The comment is still from the original project. First draft done<1>. More to come if I find time, including full-screen. Normally we will not try to force a window onto a particular screen if I remember right (I think we did previously), possibly except if the window manager does not support the EWMH full-screen window-to-screen mapping request. It'd also be good if affected users could try and xtrace this issue. Perhaps others have more luck than me. Thanks @michael and @Airblader for looking into this. @Airblader: xtrace (or x11trace on Arch) is working for me when used together with the '-e' switch which turns off all (forwarded) extensions. I have attached the log output of a session where virtualbox was running in i3 and where I've switched layout a couple of times. HTH. I am still not sure whether everyone is reporting the same issue here. But what I seem to see from Will's log file and from the video on nfb's Debian bug is someone outside - presumably i3 - repeatedly telling the virtual machine window to resize in a not-quite-consistent manner (perhaps related to the tiling concept) and VirtualBox doing its best to fulfil the request. Will, I saw your comment that the window is set to "floating", nonetheless that is what I see in the log. Airblader, does that sound at all likely? Not sure if you really want to dive into the VirtualBox source at this point, it really is quite complex. You might be better asking me what you want to look for. I think what you're seeing in the log is me trying to resize the floating window. When the automatic resize is turned on the window keeps setting itself to 271x64 even when I drag it to make it larger. Looking at the xtrace (thanks for that!) I see that over the course of the log, 25 windows execute a total of 263 ConfigureWindow requests. It's always a triple of updating WM_NORMAL_HINTS, requesting ConfigureWindow and receiving ConfigureNotify. All of these requests seem to be confirmed, but I doubt by i3. I assume most of these windows are _not_ top-level and therefore handled by X itself (which is why they're confirmed unchanged.) I'm not sure this is the problem we see, but it seems likely to me. @afwlehmann How long did you have VirtualBox running for? @michael Can you figure out under which circumstances VirtualBox sets WM_NORMAL_HINTS? A quick grep through the source against your recommendation ( :-) ) would lead me to believe it might be src/VBox/RDP/client-1.8.3/xwin.c, more specifically the function ui_resize_window. It's the only one that calls XSetNormalWMHints and then XResizeWindow right after which would fit the pattern I see in the xtrace. Of course I have no idea what this code path is related to. @Airblader: Not for very long. I just fired it up and had the virtual machine running for less than a minute while doing those container layout changes, e.g. switch between horizontal and vertical tiling. @afwlehmann OK, thanks. With 25 windows and a few triggered switches 263 requests may not necessarily be »oddly many«, but it still shows that the resize is triggered by VirtualBox. I'll recheck the log to see if there's any ConfigureNotify without prior ConfigureRequest that look weird, though. Aren't we dealing with displaying issues rather than resizing issues? Taking a look at https://ptpb.pw/FOrS.jpg I see huge scrollbars which shoot out the left part of the picture. So the resizing does actually work. At least in my case it definitely works but in order to display the whole thing right I have to restart i3. Furthermore if I start a vm without guestadditions, auto-resizing functionality etc. it is displayed on the top-left corner of the window which is an unusual behavior for virtualbox because it did always display the virtual screen on the center of the window and vb actually still does it but after restarting i3. I will append two screenshots to illustrate my experience. Maybe michael is right and I'm facing another issue? But if not, why does nobody care about the fact that restarting i3 does actually help in some way? Or does it only work for me? I don't know how to track the communication between i3 and vb, but how does the communication differ when restarting i3? It could be either a resize or display issue. The easy answer to that is: do the scrollbars work? If so, it's a resize issue (and I assume this is the case.) However, it's worth pointing out that the incorrect resize is happening in a subwindow of VirtualBox – i3 doesn't interact with these windows. The visual garbage around the guest display is simply due to VirtualBox not rendering this area when X sends an Expose event, I presume. This is probably just a consequence of the bug at hand – VirtualBox thinks its window has a different size than it actually has. I'm the OP of the awesomewm issue. I attached what I believe is an xtrace log of the interaction. What I did was basically start up a VM, move it to the second screen, it jumps back by itself to the first screen and then I quit the VM. How did you try to resize it? By resizing the window on the host? I do not see any resize requests making it to VirtualBox except for those 271x64 ones, which at least to me suggests that if that is what you are doing something intercepts them before they reach us. I tried my best! The code you found is inside the rdesktop fork with USB pass-through functionality, which we ship for people wanting to access machines remotely. It is not executed in non-RDP use, and not in the VirtualBox binary even then. 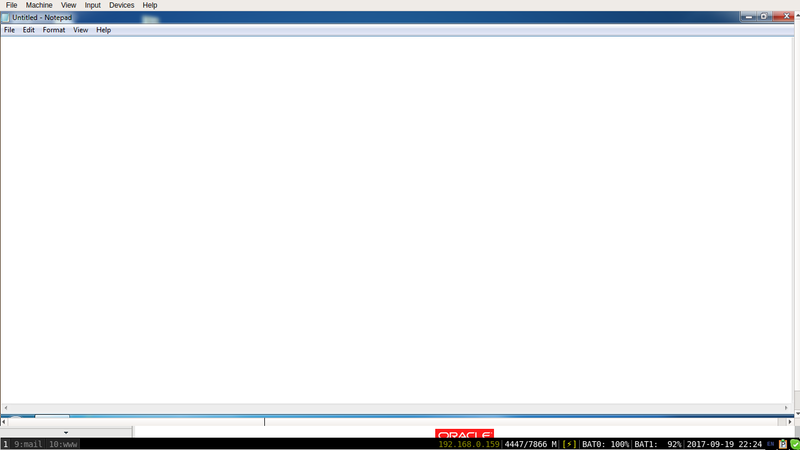 I believe that the WM_NORMAL_HINTS originates from void QXcbWindow::propagateSizeHints() inside Qt. Working out the call chain down to there is something I have not yet attempted (if anyone reading this who is experiencing the issue has debug symbols for VirtualBox and Qt installed, they could find this out quickly with breakpoints in gdb). Here is the output from gdb when I put a break-point on that method, resize the machine window in the host once by dragging with the mouse and print out the stack trace every time it subsequently stops. Qt has many good sides, but keeping things simple is not always one of them. Aren't we dealing with displaying issues rather than resizing issues? Taking a look at https://ptpb.pw/FOrS.jpg I see huge scrollbars which shoot out the left part of the picture. Scroll-bars are shown when the host window size is too small for the mode set on the virtual output mapping to that window. It looks to me like when you restart i3 it resizes the window and the virtual machine reacts by setting a matching mode on that output. In the "broken" picture with auto-resizing, the real window size is clearly too small for the mode for some reason. The problem description sounds sufficiently different to what the i3 people are talking about that I think it does not belong on this ticket. Please talk to the Awesome developers about this, and if you think that it is a VirtualBox issue we might want to see if I can investigate it with them. Will Everett, could you please do a screen recording of what you are seeing? To help me visualise. So Qt definitely handles generated ConfigureNotify events slightly differently. Actually that is just a special case to double check the position co-ordinates if the event is not generated. Interesting - the width in the two ConfigureWindow requests is 1440 pixels smaller than that in the first ConfigureNotify event. 1440 is (still just) a not uncommon laptop screen width. afwlehmann, would you be able to describe exactly what you did when you got that trace? And do you have a screen with a 1440 pixel width? The screen has a phyiscal (and logical) resolution of 1920x1080. When I started the virtual machine (being an Ubuntu guest in this case) i3 split the screen vertically, the VM was on the right-hand side. Therefore the window should have had something roughly like 960x1080. I've subsequently switched a few times back and forth between horizontal and vertical layout (960x1080 vs. 1920x540). If there's a certain scenario that you would like to see I am more than happy to provide the corresponding trace. You did not answer exactly the question I asked, though perhaps you intended your answer to be understood that way. Do you have any other screens in use of 1440 pixels wide? I am just wondering how that interesting number appeared. Let's take a step back and go through some basics of X11 window management. In its role as a window manager, i3 will select SubstructureRedirect on the root window. This will cause the X server to send requests such as mapping or reconfiguring top-level windows (direct children of root) to i3 which can then handle these events. However, this does not(!) affect any subwindows of top-level windows. Requests for those go directly to X and X will usually just acknowledge them and confirm them with the corresponding notification (ConfigureWindow → ConfigureNotify). Looking at the screenshot one can see that the statusbar of the VirtualBox window extends across the entire width of what i3 wants the window to be. This proves that the top-level window has the correct size (since a window cannot render outside of its geometry). The »broken« part – i.e., the guest display with the scrollbars – seems to be a subwindow. How this window is sized is entirely up to the client (VirtualBox / QT). Can you tell from the trace that the top-level window belongs to VirtualBox, and that it is not something the VirtualBox window is reparented to? RESOURCE_MANAGER is a root wndow property that nobody would have any business querying on any child of it, so I'd say 0x000000d7 is indeed our root window and 0x0340000e thus is a top-level window. There's plenty other similar properties queried on this parent that confirm this as well. It looks to me like someone (i3) is sending a generated ConfigureNotify to us not backed by a real one. Correct, we do send a faked ConfigureNotify – when we reject ConfigureWindow requests because they are tiled and aren't allowed to change size. This is totally fine, though. Looking at the screenshot one can see that the statusbar of the VirtualBox window extends across the entire width of what i3 wants the window to be. This proves that the top-level window has the correct size (since a window cannot render outside of its geometry). Just a drive-by comment... Have you verified whether that status bar is actually live and not some unrepainted leftovers? I.e. which of the two (or more :) status bars that you can see actually responds to e.g. mouse input (right clicks, tool tips on hover)? E.g. note that on issue.JPG the keyboard state indicator (a "key" with an arrow to the left of the rightmost Strg Rechts) has different states in the two status bars simultaneously present on the screen, so one of them must be dead pixels in some parent window. Have you verified whether that status bar is actually live and not some unrepainted leftovers? Good call – it indeed just is leftover garbage. Nonetheless, inspecting the window with xwininfo still yields that the window actually has the full size. Plus if it wasn't like that, there wouldn't be a dead area where visual garbage collects. I've added a screenshot where I used xev when triggering the auroresize. You can see that the event reported to the window has the correct width and height there as well. No other screens at the moment. Yes, I'm resizing by changing the window dimensions on the host. If the "automatic resize" is on in virtualbox as soon as I release the corner of the window it snaps back to the 271x64 size. Here are the size events which I see presumably coming from i3. Do they make sense to you? Note that the exact value is different from what @afwlehmann as an end user would expect because things like window borders and decoration have been subtracted from the window size. Also note that these are the responses by i3 and not the requests. You can see that until the user changed from horiztonal to vertical layout, i3 always sends the same geometry in the response because it answers the VirtualBox request with »nope, you'll stay this size.« When layout is switched to vertical, i3 resizes the window and thus now reports a different size in the response. I would be interested if someone could log (using gdb or whatever) calls to QXcbWindow::handleConfigureNotifyEvent(), UIMachineWindowNormal::event(), UIMachineView::eventFilter() and UIMachineView::resizeEvent() with parameters immediately after a resizing goes wrong inside the VirtualBox process. It may help with this if you start the machine process directly from the command line with "VirtualBox --startvm <machine name>". Checking that the events are really resize events would of course be helpful if possible. I can reproduce something which looks similar by triggering a resize using "xrandr" in a guest, intercepting the call to xcb_configure_window for the main window in gdb (inside the VirtualBox process on the host of course) and forcing the width and height back to their old/current values. // geometry, and may think the requested geometry was fulfilled. Which I suspect Qt kindly filters out for us when it sees that there was no real change. Since we are a cross-platform application and use Qt for interacting with the different host systems we are rather dependent on the way Qt works, and Qt is sometimes somewhat over-eager to hide what is happening underneath; the trick will probably be to find the least intrusive way to persuade Qt not to ignore this event and not to hide it from us. I don't quite follow. QT hiding the no-op event should only be a problem if VirtualBox assumes its resize requests to succeed unconditionally. And if this is the case, VirtualBox is clearly violating the X11 specification. The fact that it's cross-platform doesn't change that, you still need to comply with how a specific platform works. And even if you get QT to report the event it would still mean that VirtualBox first makes an incorrect assumption and is corrected shortly after. Which means you'd nullify the effect of the bug quickly, but the bug would still exist. But perhaps I'm misunderstanding something? As far as I can see (I am not actually our Qt person, Linux/X11 is more my area, and Qt as far as it intersects with those), when we ask Qt to resize the main window it proactively resizes all the sub-windows - of which it, not we controls the geometry - assuming that the resize request will succeed. Finding the best way of telling that the request failed, probably by breaking into Qt's event queue before it can filter the event out (if that is indeed what is happening) to at least nullify the effect as you put it would be one way. A separate code path on X11 hosts calling xcb_configure_window() directly rather than setting the geometry through Qt, so that Qt only learns about the change from the resize event, would be another - and hoping that there are no unwanted side effects. Again, assuming that my analysis is actually right, which is definitely not guaranteed at this point. I am currently going through the Qt code trying to follow the paths; unfortunately Qt is like C++ in that respect: to understand it properly you need to devote your whole time to it, and not try to do other things in parallel, like using it to create applications. Thanks guys for putting so much effort into this! If anyone subscribed to this ticket is building themself, they might like to try out the following patch. I will try to get test builds done tomorrow or the day after. Thank you Michael. I rebuilt the VirtualBox debian package from source, using your patch. Seems to be working correctly in tiled mode with wmii. However, if I switch to floating mode, where windows are treated just like in classical window managers, the window sticks to 0x0 size, and moves to the upper left corner. The patch seems to completely bypass all the code to set WM hints etc, so I guess when you switch to the floating mode, the missing (or all zero) hints confuse the WM. I think this really should be taken up with Qt. It's a Qt5 bug (Qt4 seems fine) you can reproduce with the simplest app. Trying to work around this at the application will be extremely fragile and counterproductive. Another trial patch. Will try to do the test builds tomorrow. Test builds available on the web page<1>. Works like a charm in i3 except for floating windows for which resizing is still broken. But it's definitely something I can work with. Thanks a lot! Same for me with wmii. The behavior is the same as with the previous patch. In those cases which do not work, I would be interested in seeing the output of xprop on the problematic window with and without the patch. Just to be clear, I hope that the output I asked for will help find out why the floating window mode is not working with the change. I would rather not leave the change in though if I can't find that out, since given that there are regressions even with this small amount of testing chances are quite high that there will be more if the change lands in a release, and that the change will overall be for the worse. More generally, the team was not happy with the idea of keeping this change in the long term to work around a Qt bug (which the Qt team are clearly aware of<1>), so we suggest that someone should take this up with them and strongly suggest that they back-port it to 5.6, which we will be sticking to for now. My patch to VirtualBox should actually be a reasonable basis for a fix in Qt. Uploading a slightly modified patch, test builds<1> should be available soon (any build as of revision 111509 should contain the patches, at least as long as they have not been reverted). Still no feedback. New test builds<1> available. Patch to follow. As things stand we can't leave these changes in though, due to the known regressions in floating mode. I can confirm that the test build 5.1.x revision 111573 does fix the issue. I've tested 5.1.x revision 111643. It works fine. Thanks for your hard work @michael . I would very much like to have confirmation that the floating window regression is fixed (and possibly that another regression is too), if indeed it is, before I take this change into a release. Works for me in tiling mode, but not in floating mode (tried both a Windows 10 as well as a Ubuntu client). Thanks for checking. That means though that unless someone can find out what is wrong we will probably not be able to include the fix in future releases. In any case someone needs to open a Qt bug for this to get it fixed at source. I've been stuck in 5.0 version due this bug. I've found this thread and tested testbuild Version 5.1.9 r111724. I can confirm tiling mode works as expected. But if I change to floating mode and try to resize window, it disappears. It returns when I switch back to tiling mode. Host: Fedora 24, dwm 6.1, Qt 5.6.1 - Guest: Windows 7. I wish to thank for the fix. Please give build revision 111900 a try both in tiling and in floating mode. This build does not contain any fix, just a temporary work-around (which can not be kept because it is known to cause other problems). I've tested revision 111900: Tiling mode works ok. Switching to floating mode makes VB window disappear. Switching back to tiling mode makes VB return, but wrong size. See attachment. I confirm that 111900 works as expected in i3wm. Has this been reported to QT? I "upgraded" from 5.1.9-111724 to 5.1.10 today and got the resize bug again. I guess that was suspected since the fix was only temporary and not final? I am not aware of anyone having reported this to Qt. I would expect one of the people affected to do so if they consider the issue important enough. I'm also having some issues since some update. When I'm running two monitors, and I move VirtualBox to the second, larger, one, it still keeps the resolution of the main display. Sometimes weird scrollbars even appear.b In seamless mode, however, the resolution is fine. So the partial workaround I found is to disable auto-resize, switch to seamless mode, and then to full-screen. In short, the WDDM driver somehow takes the small window size and tries to apply it as Windows' native resolution at boot time, which then fails and renders the guest unresponsive. The value is saved into the registry by the WDDM driver, so a workaround is to modify the offending registry entry immediately after installation of the driver (or revert to a snapshot of the VM pre-GA installation). I have not yet found a way to recover VMs that cannot boot due to this issue yet, as when the registry is mounted offline, the necessary entry for the VirtualBox display adapter does not appear. For the record, I am running 5.1.22 and still am affected by the resize bug. I suggest its worth taking a look at some of the defects xref from #16240. On windows, multi-monitor detach was broken for several releases, but on 5.1.22 this seemed specifically to relate to the resize that took place on monitor detach where the detaching monitor is taller than the one that the vm display is moved to, causing the guest vm to crash. I think it worth testing 5.1.24 in case your issue is now fixed. It's becoming more annoying lately. I could just stay on VirtualBox 5.0.x, but it also prevents me from updating my kernel from 4.9 to newer versions, because VirtualBox 5.0.x kernel module doesn't build on newer kernels. @WGH_ The Qt developers say that this is fixed in the not-yet-released Qt 5.10. Are you running that? And if you are, are you sure that this is a VirtualBox problem and not another Qt one? We have already spent time investigating this which we would rather have spent improving other things. @michael no, I'm not. I'm unable to install development Qt version on my main system due to obvious concerns. I might be able to setup some testing environment later on, and when I do, I will certainly report any findings. Qt 5.10 (which was recently released) fixed the issue for me (I'm running i3).